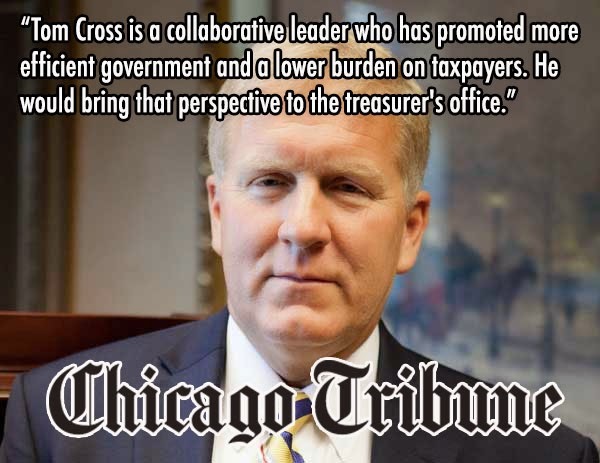 Tom Cross - candidate for Illinois Treasurer - continues his string of endorsements from newspapers today with his fifth-straight endorsement: The Chicago Tribune. Treasurer Dan Rutherford ran unsuccessfully in the Republican primary for governor. Democratic state Sen. Mike Frerichs and Republican state Rep. Tom Cross want to succeed Rutherford as treasurer. The Tribune today endorses Cross. Cross is a collaborative leader who has promoted more efficient government and a lower burden on taxpayers. He would bring that perspective to the treasurer's office. ... But he, more than Frerichs, could be counted on to use the office to keep the pressure on reducing state government costs. Over the course of his career he has been a consistent fiscal conservative and he has worked in bipartisan fashion. His overall record as House minority leader was admirable. We're confident he would protect taxpayers' investments and continue to push for lean, effective government.